I don’t consider myself a cold weather person. The thought of frosty mornings and short, dark days doesn’t appeal to me in the slightest. Nor does waking up before sunrise and layering on a million sweaters just to walk around the house. But if there’s one thing I can get behind, it’s slowing down, savoring my morning, and really enjoying a piping hot cup of coffee. Not only is my morning cuppa coffee the first thing I think about when I wake up but it’s nearly impossible to start my day without one. I get an absurd amount of pleasure in playing with ingredients and flavor combinations and savoring my creations in the quiet stillness before everyone else wakes up. It’s a non-negotiable part of my morning routine. But as a small business owner, the first part of my morning can also be pretty hectic with emails pouring in and fires leftover from the day before. So it’s important for my coffee to be quick, easy, and still taste good. While I’ve had a standard coffee pot for years, I have been contemplating getting a single-serving coffee maker for a while now. Less prep work and cleaning is a real godsend on busy days. 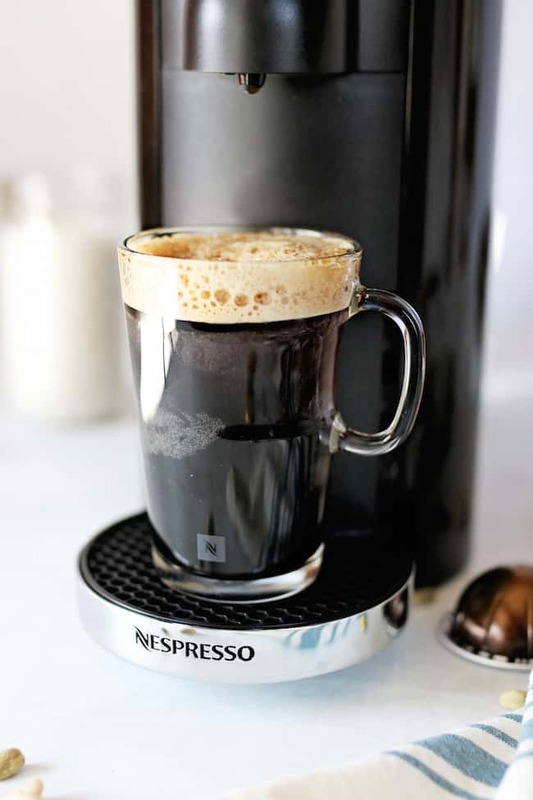 So when Nespresso asked if I wanted to test its new Nespresso VertuoPlus Machine, I happily accepted. My parents have had a Nespresso machine for making espresso for years (and they love it). 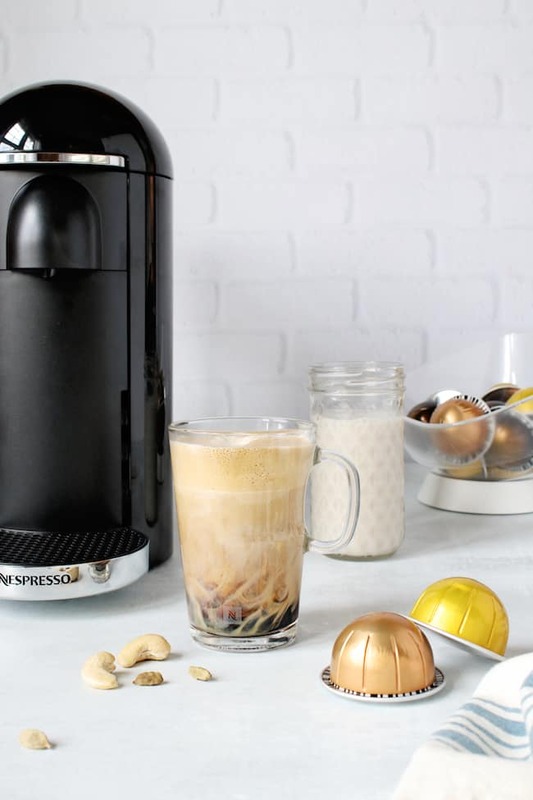 But what makes the Nespresso Vertuo Plus Machine different is that with the push of a button, it can make both coffee and espresso depending on the pods you use. And because it’s so versatile, it’s perfect for coffee drinkers (like me) and connoisseurs (like my husband) alike. To top it all off, each cup is finished with a layer of frothy crema, which makes you feel like you’re hanging out in your favorite coffee shop. I can honestly tell you we’re both obsessed with it, especially when it comes to trying new flavors and making our own creamers. 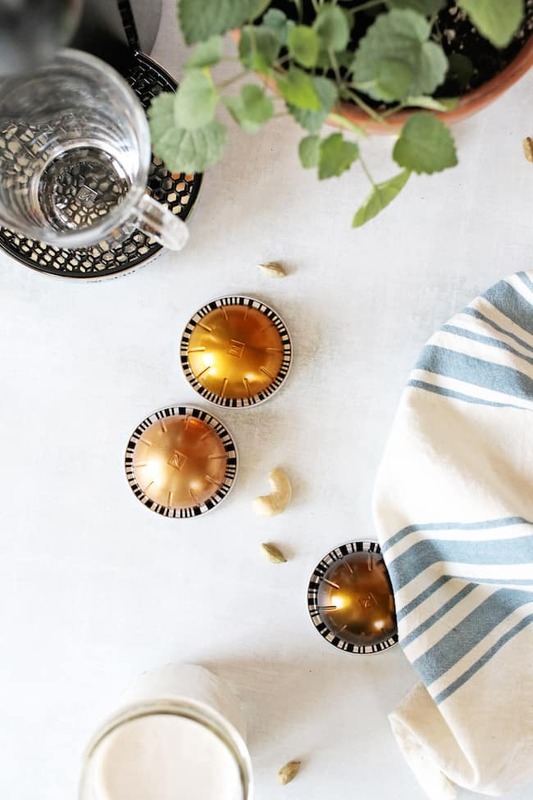 One of my favorite ways to spruce up my coffee is with this homemade cashew creamer. I recently discovered that you can make a version of homemade cashew milk that’s thicker and perfect for adding to coffee. 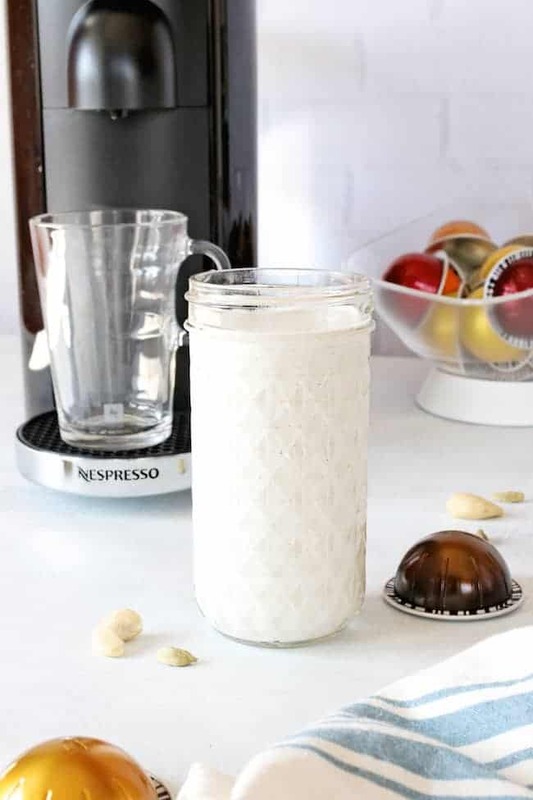 Here’s the secret that will unlock some morning magic for you: blend the soaked cashews with less water and don’t strain it when you’re done. 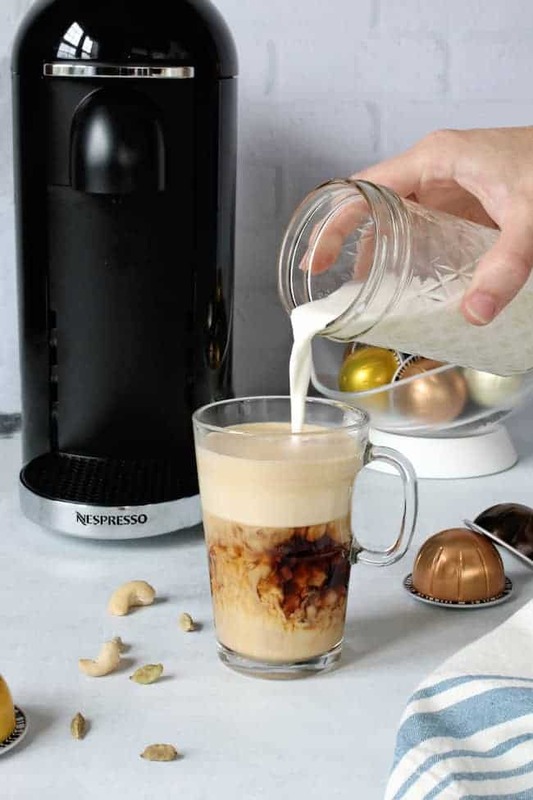 Just pour it into your freshly brewed Nespresso and it will hands-down be the best latte you’ve ever had. 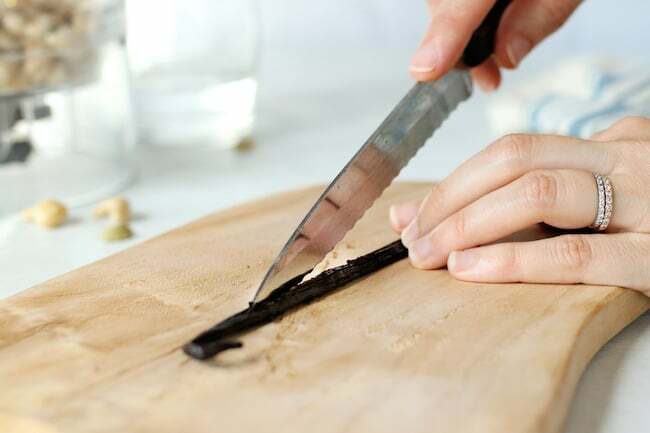 Since its fall, go ahead and add some cardamom, fresh vanilla bean and nutmeg to warm it up. And a pinch of salt and some honey? Game over. When recipe testing, I “sampled” about 50 cups of cardamom coffee and it was the best week of my life. It makes frosty mornings bearable and maybe, just maybe, even something to look forward to. Combine all ingredients in a blender and puree on high until smooth. Without straining, transfer cashew milk to a glass jar and store in the refrigerator for up to 4 days. The creamer sounds so great! Thank you for sharing! One of the most anticipated for me in winter is hot drinks and hot food :) Can’t wait to try this recipe.